Few of us growing up in the US in the 1960s realized there was such a thing as the “Long Range Desert Group” of David Sterling or that it was an all British affair manned by the Special Air Service. We thought the heroes in the souped-up jeeps belonged to Americans as evidenced by the “Rat Patrol’ with Christopher George chasing Eric Braeden (AKA Hans Gudegast) around the Mojave Desert! Needless to say once you began to read up on the subject you find out all about this particular group and its accomplishments in long range desert reconnaissance among other skills. 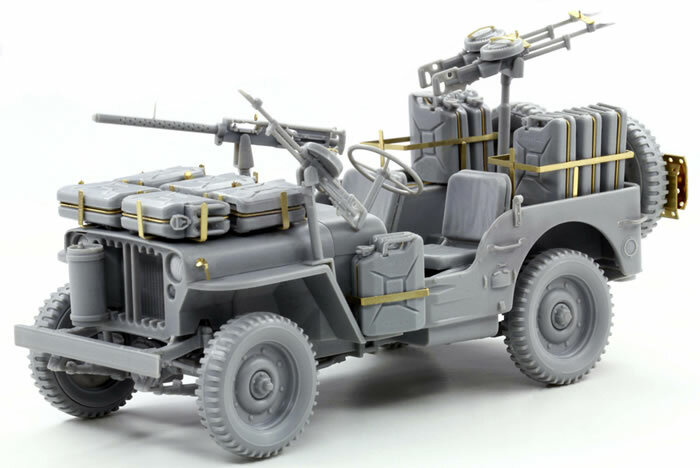 This has always been a popular conversion of the Willys MB Jeep and more than 35 years ago Tamiya released its kit no. 35033 based on a modified version of their Jeep and with figures of two British personnel in Arab burnouses as crew. Italeri countered later on with their Kit No. 320, “Commando Car”, which was the SAS modified jeep but with markings for northwestern Europe instead. Both had some problems with the base kit, but the Italeri one was the better of the two. 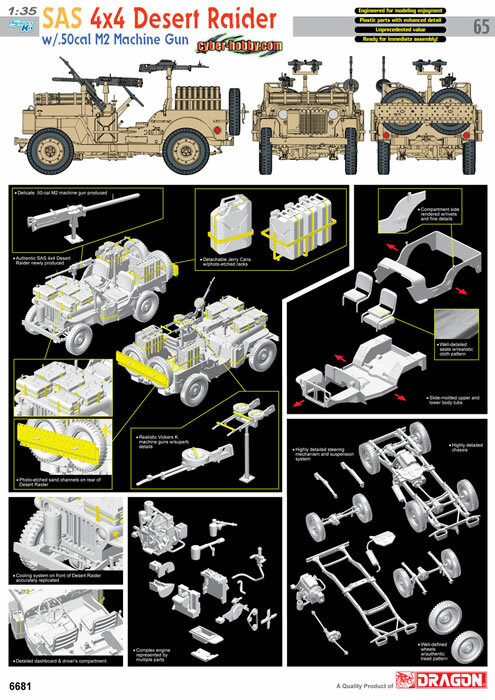 Surprisingly Tamiya released a new Jeep kit (No. 35219) but did not update or upgrade their SAS version. When DML’s boutique affiliate announced this kit I originally suspected that it was the Italeri kit with some etched brass and tweaking; not so. This kit may owe some of its parts breakout to the older kit but is a new mold kit from the ground up. 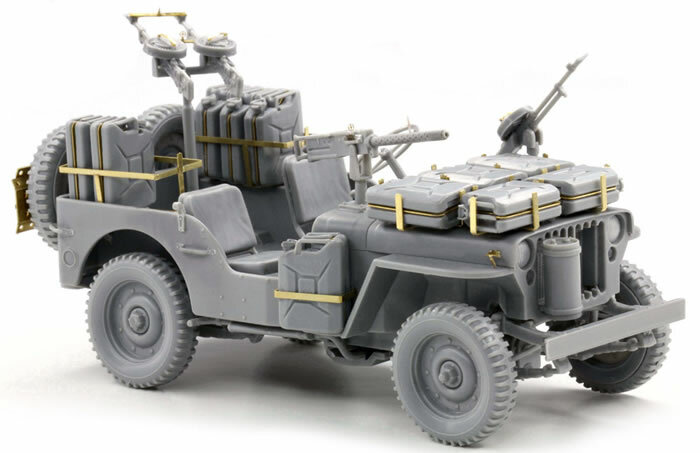 Note that because of the Chrysler Corporation demand for royalties for using the name “Jeep” this kit, like the Opel Blitz before it, does not state what it IS but just sort of what it DOES. 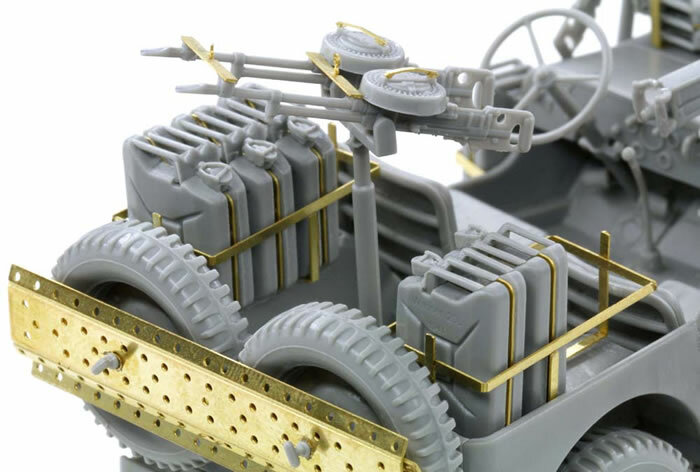 The kit essentially comes on two sprues - wheels and tires and then everything else – but the body and frame are removed from their sprues and bagged separately in the box. The body is slide molded with all but the rear plate in one go. There are some serious injection pin marks on the bottom of the body and under the fenders, but other than the fender wells I don’t think most modelers will bother with removing them. The frame is also one piece with all braces and the rear “bumperettes” molded in place, and as it has the round front frame spacer I think it is the Ford GP variant (and I am not sure how they look at the royalties market either!) A so-so tow hook is also molded in place on the frame, but as the opening section of the military hitch is provided (part B45) as a separate part it will probably look better when assembled. The drive line is typical of modern kits, axles with differentials and a separate differential cover, separate shock absorbers, steering links and a tie rod. The transfer case comes with the front drive shaft in place but the rear one is a separate part. The wheels are conventional front half with all tread/rear insert type (staggered tread pattern) and separate brake drums. Springs are the usual type, but the skid plate comes with the muffler attached (part B41) which is new to me for an assembly. One of the other initial steps is the assembly of the 12 “jerry” cans. These are the standard set issued with most of the German kits and are either mounted in groups or one of five separate cans with a cross bracket on the hood. The engine consists of 15 parts and looks the part, and it comes with a separate radiator. This consists of three main parts, but it also has the headlights and blackout lights attached. These take clear lenses (for those who wish to use them) and must be installed before the radiator is mounted to the body. It also comes with an expansion tank (part B21) but no hoses are provided to connect them. The seats have separate pads and backs, and the controls are very complete, to include pedals and a sun compass (part B18). 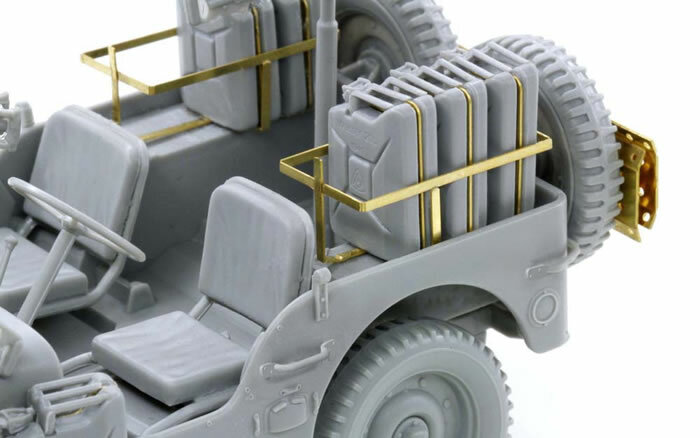 Twin sand trays are provided from etched brass and mount at the rear over the spare tires. 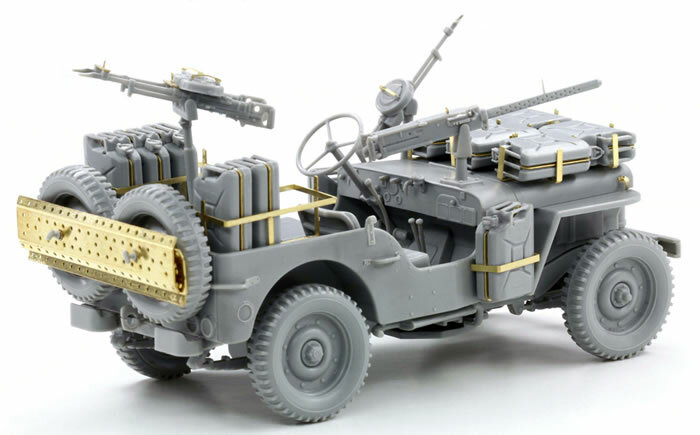 The vehicle’s armament consists of three .303 Vickers “K” gas operated machine guns (one single and a set of twins) and a .50 caliber M2 air-cooled model with the aviation sleeve on the barrel. All four are slide molded with hollow bores and come with four magazines for the K guns (with etched brass handles) and a box magazine for the M2. The latter consists of 13 parts with optional etched brass or styrene where an advantage. The twin Ks also use spacer/brace bars made of etched brass. Painting and marking consist of painting the model 8th Army Desert Sand and the instruments and placards on the dashboard; a small sheet of Cartograf decals is provided for the latter.